SB309 RELATING TO TRAFFIC VIOLATIONS. SB411 SD2 HD2 RELATING TO TRANSPORTATION. SB509 SD2 HD1 RELATING TO THE DEPARTMENT OF TRANSPORTATION. SB510 SD1 RELATING TO THE DEPARTMENT OF TRANSPORTATION. SB511 SD1 RELATING TO THE DEPARTMENT OF TRANSPORTATION. SB512 SD1 HD1 RELATING TO THE DEPARTMENT OF TRANSPORTATION. SB513 SD1 RELATING TO THE DEPARTMENT OF TRANSPORTATION. SB514 SD1 RELATING TO THE DEPARTMENT OF TRANSPORTATION. SB650 RELATING TO RAPID OHIA DEATH. SB651 SD2 RELATING TO AGRICULTURE. SB652 SD1 HD1 RELATING TO SPECIAL PURPOSE REVENUE BONDS TO ASSIST KEAHOLE FBO I LLC. SB653 SD2 HD1 RELATING TO ELECTRIC VEHICLES. SB654 SD1 RELATING TO KEKAHA KAI STATE PARK. SB660 HD1 RELATING TO STATE IDENTIFICATION CARDS. SB664 SD1 RELATING TO CONTRACTING FOR PUBLIC FACILITIES. SB665 SD1 RELATING TO ELECTRIC FOOT SCOOTERS. SB1091 SD2 HD2 RELATING TO THE DEPARTMENT OF TRANSPORTATION. SB1156 RELATING TO HURRICANE PREPAREDNESS. SB1158 SD2 HD1 RELATING TO SCHOOL SUPPLIES. SB1160 RELATING TO EXPERT WITNESS FEES. SB1161 SD2 RELATING TO TRANSPORTATION NETWORK COMPANIES. SB1332 RELATING TO CAPITAL IMPROVEMENT PROJECTS FOR THE BENEFIT OF THE FOURTH SENATORIAL DISTRICT. SB1333 SD2 HD1 RELATING TO PROCUREMENT. SB1380 SD1 RELATING TO SUSTAINABILITY. SB1385 SD2 RELATING TO THE KANEOHE BAY REGIONAL COUNCIL. SB1434 RELATING TO FEMALE GENITAL MUTILATION. 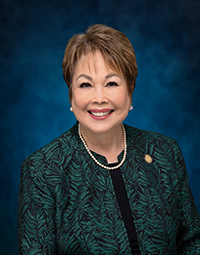 SB1502 RELATING TO THE CHAIRPERSON OF THE HAWAIIAN HOMES COMMISSION. SB1503 SD1 RELATING TO VOTING. SB1506 RELATING TO THE STATE BUILDING CODE COUNCIL. SB1507 SD1 RELATING TO THE ECONOMY. SB1508 RELATING TO RENT TO BUILD EQUITY. SB1510 RELATING TO DOWN PAYMENTS. SCR26 URGING THE COUNTIES OF THE STATE OF HAWAII TO IMPLEMENT PROCEDURES OR TECHNOLOGIES TO EASE THE PROCESS IN WHICH DRIVER'S LICENSES ARE RENEWED. SCR27 REQUESTING THE UNITED STATES GOVERNMENT TO LEASE FEDERALLY OWNED VACANT LAND TO THE STATE OF HAWAII TO BE USED AS TOW YARDS TO STORE ABANDONED VEHICLES. SCR48 URGING THE DEPARTMENT OF AGRICULTURE TO RESTRICT THE DEVELOPMENT OF ANOTHER DAIRY FARM ON THE CURRENT BIG ISLAND DAIRY SITE IN OOKALA, HAWAII. SCR57 REQUESTING THE DEPARTMENT OF BUSINESS, ECONOMIC DEVELOPMENT, AND TOURISM TO CONDUCT A STUDY ON POPULATION DECLINE IN THE STATE. SCR65 URGING THE DEPARTMENT OF ACCOUNTING AND GENERAL SERVICES, CITY AND COUNTY OF HONOLULU, AND FRIENDS OF HONOLULU CITY LIGHTS TO DISCUSS THE EXPANSION OF HONOLULU CITY LIGHTS FESTIVITIES TO INCLUDE THE STATE CAPITOL GROUNDS. SCR155 URGING ALL APPLICABLE STATE AGENCIES TO WORK TOGETHER WITH INTERESTED STAKEHOLDERS, INCLUDING THE HONOLULU HARBOR USERS GROUP, IN ASSESSING THE RISK OF AQUATIC INVASIVE SPECIES TO HAWAII, VECTORS, AND POSSIBLE MITIGATIONS, IN PREPARATION FOR THE ESTABLISHMENT OF NEW FEDERAL STANDARDS IN 2022. SCR156 REQUESTING THE STATE AUDITOR TO CONDUCT A PERFORMANCE AND FINANCIAL AUDIT OF THE HAWAII GREEN INFRASTRUCTURE AUTHORITY, INCLUDING THE HAWAII GREEN ENERGY MARKET SECURITIZATION PROGRAM. SR18 URGING THE COUNTIES OF THE STATE OF HAWAII TO IMPLEMENT PROCEDURES OR TECHNOLOGIES TO EASE THE PROCESS IN WHICH DRIVER'S LICENSES ARE RENEWED. SR19 REQUESTING THE UNITED STATES GOVERNMENT TO LEASE FEDERALLY OWNED VACANT LAND TO THE STATE OF HAWAII TO BE USED AS TOW YARDS TO STORE ABANDONED VEHICLES. SR34 URGING THE DEPARTMENT OF AGRICULTURE TO RESTRICT THE DEVELOPMENT OF ANOTHER DAIRY FARM ON THE CURRENT BIG ISLAND DAIRY SITE IN OOKALA, HAWAII. SR43 URGING THE DEPARTMENT OF ACCOUNTING AND GENERAL SERVICES, CITY AND COUNTY OF HONOLULU, AND FRIENDS OF HONOLULU CITY LIGHTS TO DISCUSS THE EXPANSION OF HONOLULU CITY LIGHTS FESTIVITIES TO INCLUDE THE STATE CAPITOL GROUNDS. SR121 URGING ALL APPLICABLE STATE AGENCIES TO WORK TOGETHER WITH INTERESTED STAKEHOLDERS, INCLUDING THE HONOLULU HARBOR USERS GROUP, IN ASSESSING THE RISK OF AQUATIC INVASIVE SPECIES TO HAWAII, VECTORS, AND POSSIBLE MITIGATIONS, IN PREPARATION FOR THE ESTABLISHMENT OF NEW FEDERAL STANDARDS IN 2022. SR122 REQUESTING THE STATE AUDITOR TO CONDUCT A PERFORMANCE AND FINANCIAL AUDIT OF THE HAWAII GREEN INFRASTRUCTURE AUTHORITY, INCLUDING THE HAWAII GREEN ENERGY MARKET SECURITIZATION PROGRAM.